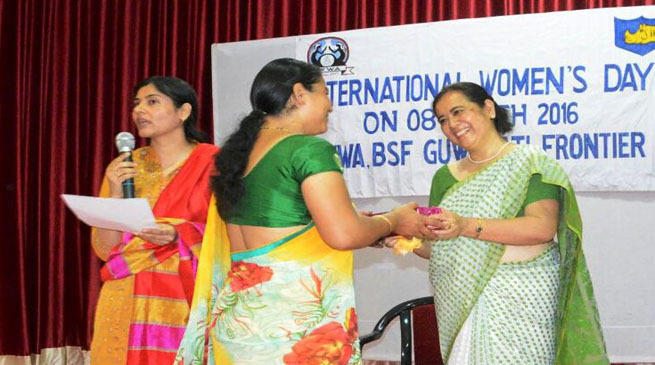 BSF Wives Welfare Association (BWWA) observed “International Women’s Day” in Guwahati and Chirang on 08th Mar’ 2016. The event was organized to promote justice, dignity and women’s equality. The occasion was marked by organizing various types of competitions, amongst families of BSF and NDRF personnel, residing at Patgaon campus in Guwahati, like mehendi competition, rangoli making competition and cooking competitions. Addressing the ladies, the BWWA President of Frontier HQ BSF Guwahati highlighted the achievements of women in various fields, be it education, jobs, sports events or in the Forces. She exhorted the ladies to be inspired by these developments and in still confidence in the minds of their girl child, besides making the male child aware about the dignity and equality of women. Meanwhile, Border Security Force troops deployed in Devshri area under PS Runikhata, Chirang distt of Assam assisted Mahilla Samitee of Runikhata to organize a procession from Runikhata to Dadgiri vill near the Indo-Bhutan border, on the occasion of International Women’s Day, from 0900-1600 hrs. BSF troops provided all sorts of assistance in the form of refreshments to the participants, numbering around 500, besides providing security, alongwith Assam Police. The participants expressed their sincere gratitude to BSF troops for their Good Samaritan efforts.